Medium-pacer Lonwabo Tsotsobe and left-arm spinner Robin Peterson have been named in South Africa's Champions Trophy squad, marking their return to international cricket. They take the place of Morne Morkel and Vaughn van Jaarsveld. Charl Langeveldt missed out on a place after failing to fully recover from a shoulder injury. Tsotsobe, who had a memorable one-day debut against Australia in January when he took 4 for 50 in Perth, missed the home series against the same opposition with a knee injury. He showed good form in the recent Emerging Players' Tournament, where he took nine wickets in four games at 28.44 and was handed a central contract in February. 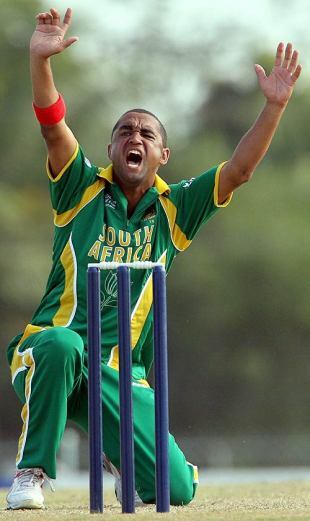 Peterson last played an ODI in 2007 though he was part of the Twenty20 side that beat Australia 2-0 at home this year. He has performed consistently on the domestic circuit - taking 17 wickets from eight games in the 2007-08 season, including a best of 7 for 24, and nine from four matches in the 2008-09 season of the MTN domestic championship. Morkel has had a poor year in one-dayers, taking just seven wickets in five matches at 36.57, and played only one match in the World Twenty20. Mike Procter, the selection convenor, said he had to miss out given South Africa's abundance of fast bowlers and the emergence of Tsotsobe and Wayne Parnell. "Langeveldt is not fit enough yet to be considered after his shoulder surgery and Morne Morkel is the unlucky one to miss out," Procter said. "He [Morkel] is very much part of our long-term planning and has a major role to play but we would like to see more consistency from him at this stage." "The selection panel attaches great value to experience, which is well illustrated by the mentoring role Makhaya Ntini has fulfilled with Tsotsobe," Procter said. "Bringing players like Tsotsobe, Parnell and Roelof van der Merwe into a winning culture has also enabled them to mature as international cricketers quickly. We have four quality spin bowlers and two allrounders in [Jacques] Kallis and Albie Morkel to back up the seam attack. There is also batting potential most of the way down the order."